The ST version of Hardball! is a game with strong virtues and weaknesses. The graphics are mostly superb, the game interface is user-friendly and the basic pitcher vs. batter mano a mano is the best ever computer recreation of that elemental sports confrontation. 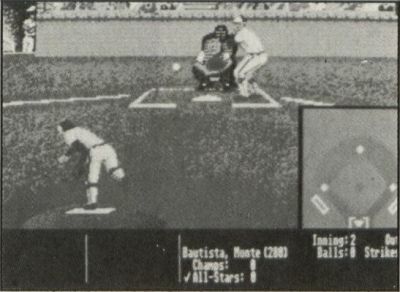 Visuals are displayed via three graphic screens, augmented by a small, stationary overhead view in the lower right or lefthand corner (depending on which side of the plate the batter swings from). There is also a stat/scoreboard screen that appears periodically. The pitcher/batter screen represents the now familiar TV camera view from left centerfield (i.e., the perspective of a runner taking a short lead off second). The fielding screens present the standard behind-the-plate view, but with the stadium split up the middle into two screens. Depending on where the ball is hit, either the left or right views are displayed. These fielding screens are a problem. It was clearly not possible to squeeze in the entire field depths, yet here they are anyway. The centerfield seats appear to begin about fifteen feet behind second base, while left, right and center fields share the same dimensions. This inaccuracy creates massive distortions in the play. Once a ball is hit, the program "assigns" the human manager control (via joystick or mouse) over the player best able to field the ball. But as the horsehide comes rocketing off an opponent's bat to, say, the left side of the field, the user has no way of knowing whether he will be controlling the shortstop, third baseman or left fielder! Line drives travel like wire-guided missiles about 16 inches off the ground, while the occasional high fly can only be tracked by its shadow. The short outfield causes quite a few of those ridiculous centerfield to first base putouts on ground balls (there are even occasional 8-4-3 relay putouts at first base). But, for some reason, throws from right field to third base, or left field to first, seem to take hours. On the offense, players select strategic moves (steal a base, bunt, swing away) and bat position (swing high, low, inside, outside, etc.) from a simple menu. When on the field, they select the type of pitch (fastball, curve, slider, etc.) and location. Choosing the center location always results in a strike, but more marginally positioned pitches can also cross the strike zone. Unfortunately, pitch selection is seemingly assigned at random, rather than on the basis of what a real pitcher might actually throw. Available pitches include: fastball, curve, screwball, change-up, sinker, off-speed and slider. Each pitcher has a menu of four pitches, but rather than the normal configurations—fastball/slider, curve/change-up, etc.—players sometimes wind up throwing a change-up and an off-speed pitch, but no fastball! What's the point of two off-speed pitches and no fastball off which to vary them? In an attempt to inject some strategic viability into the program, each nonexistent player is assigned a batting average. Batting averages are meaningless enough in a stat-oriented milieu (slugging percentages are superior power indicators, and on-base averages better gauge one's ability to reach base), but this is an action game where the player is not only swinging the bat, but positioning it as well. It would have made far more sense to indicate hitting tendencies, (i.e., line-drive hitter, pull hitter, power hitter). As it is, the numbers do add some interest, but only from a defensive perspective in one-player contests (when pitching to computer-controlled batters). The computer manager is pretty awful. With runners on first and third, and two outs, a ground ball was hit to the computer team's second baseman and he threw home, allowing a run to score. This sort of tactical malfeasance is commonplace. Another sore point is the lack of a box score. No tally is presented to list hits, walks or strikeouts, other than the basic line score (runs, hits, errors). Moreover, there's no allowance for saving games, and, considering how long a 9-inning game takes, this feature would be exceedingly welcome. What does work on Hardball! is pitching and hitting. In fact, what this program really reminds me of is stickball, the two-player game where a target is chalked on a wall, with one player pitching and the other hitting (using a broomstick handle for a bat), with the strike zone painted on the backstop. Pitching is especially enjoyable, providing the user with a fascinating insight into the pitcher's art. The skills involved in pitch selection and the importance of location have never been better simulated. In any case, Hardball's virtues—excellent visuals and a brilliant simulation of the pitcher-batter showdown—are more considerable than its inadequacies, and it is the only action baseball game on the ST. So, until something better comes along, this one is recommended.